What will you do when you find a site loaded with ‘Exclusive’ goodies crafted just according to your taste….?? I know how it feels like…I felt the same when I got mail invitation to go around the site ‘ExclusiveLane’. I don’t know how much time I spent across checking out each and every product….and how excitedly I waited to see more when the page was loading….As Raksha Bandhan is round the corner….I am searching out for some exclusive gifts for my darling sister-in-laws….As my husband has got four sisters…choosing something exclusive as per their taste is much tedious job. But my work is eased now…as ‘ExclusiveLane’ has got beautiful collection in ‘Kitchen & Dinning’, Décor, Lightning and much more…. 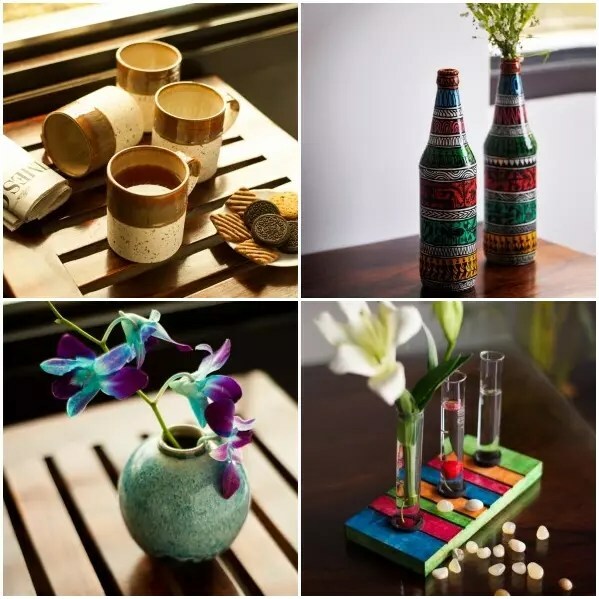 Look what I found out after just spending few minutes…..as every product is so beautifully crafted that I feel like picking up everything….decision making was very tough…as I liked almost everything on their site. So here are some of the things which I picked up….Being teacher and mom of two grown ups, her mornings are mad rush. In that rush hour too she sits back to sip her first morning cup if tea in full leisure. She says tea is a therapy to that ignites the senses and has to be enjoyed in utmost leisure. What could be better gift than these beautiful Hand Crafted Studio Pottery Ceramic Cups.My second SIL is very calm and patient person who has got passion for hand crafted goods. When I saw these Hand Crafted ‘Studio Pottery” Glazed Vase in Teal, i quickly added them to the e-basket. Me and my third SIL are of same age. So we hang around together most of the time. She is fond of interior designing and always in the processes of setting the house. Her house is like a little museum and these Set of 2 Decorative Vases in Bottle Shaped will add life to it. My younger SIL is very fond of plants and flowers. 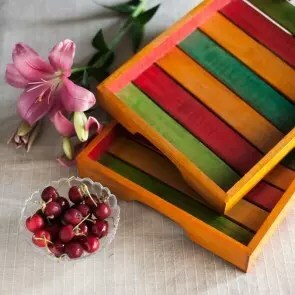 Most of the time I see her in the home garden and she talks mostly about nature, plants, flowers, etc……nothing can make her more happy than this Quickry multicolour wooden Test Tube Planter and I know she will be the first to call me up to say how much she is going to adore this…..As I can’t resist myself, I bought these Muticolor Wooden Trays for me, to pamper the food blogger in me….Wish I too had a bro, to take me shopping on an ‘ExclusiveLane’ and buy me more…..wink emoticon…. Though this year, I may not be able to go and deliver the gifts to my sister-in-laws…I thought of making sweets and send them as one of my cousins is leaving to native just before ‘Raksha Bandhan’…..we don’t celebrate this festival, but as we did not go native this Ramadan, I thought of surprising the ladies with these gifts and sweets…. This post is a part of ‘The ExclusiveLane Blogger Contest’. I was in a mood to make rava ladoo aka sand laddu….that is what Lil’M calls them…from long. What could be more perfect time than this….There may be many variations in making these ladoo’s but I follow this simple method. Let me just pop in one; before I go down to write the recipe. Dry roast saffron strands for few seconds and crush with your fingers. Set aside. In a heavy bottom cooking pan, dry roast semolina until raw smell wafts. Take care not to burn the semolina. Turn off the flame and leave it to cool. Add 2 tbsp. of ghee to pan and fry halved cashews until nice golden. Meanwhile grind the sugar to smooth powder. Take out in a wide bowl. Now grind dry roasted semolina to fine powder. Add this to sugar powder. To this add fried cashews, cardamom powder, dry coconut powder and crushed saffron. Combine well. Now add spoon by spoon melted hot ghee and gently fold in the mixture. Carefully using a wooden spatula combine the mixture with ghee. It will now look like bread crumbs. Grease your palms with ghee and slowly add melted hot ghee to the above mixture and start to make ladoos of your desired size. Garnish with saffron stands and serve. These stay fresh for a week when stored in a clean and dry air tight container. 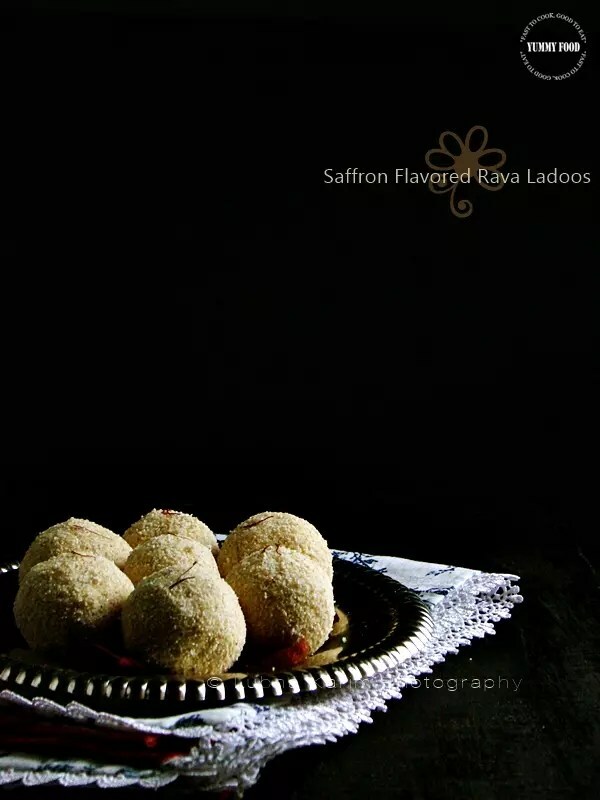 Add love to make these ladoos taste ‘Yummy’. These make best edible gifts and you can even make these ahead. So what you are making this festive season? Share your recipes in the comment line and I will share it on my facebook page…. Wishing ‘Happy Raksha Bandhan‘ to all the people celebrating this wonderful festival. I love saffron (and ghee, and cardamom…) so this sounds like a perfect dessert for me! What a beautiful recipe! It's not a flavor profile that I'm used to working with, but sounds amazing. Pinned! Loved each and everything about this post! Very beautiful crafts and tempting looking Ladoos!